Rory McAllister scored from the penalty spot for Peterhead. Picture: SNS. Montrose stay a point clear at the top of League Two after a comfortable 2-0 success at eighth-placed Edinburgh City who finished with ten men. Michael Bolochoweckyj fired Montrose into a 36th minute lead, swiftly doubled by Lewis Milne from a Andrew Steeves cut-back. Any slender hopes of an Edinburgh riposte were extinguished in the 67th minute as forward Farid El Alagui was dismissed for a second bookable offence. Second-placed Peterhead’s challenge shows no sign of faltering, though, as the Blue Toon earned a 4-3 victory over Stirling Albion at Balmoor. Willie Gibson opened the scoring for Peterhead within 35 seconds, but Stirling levelled quickly through Willie Robertson. Rory McAllister won and then scored a penalty to restore Peterhead’s advantage in the 23rd minute, only for Albion to again equalise through Darren Smith. A double from substitute Russell McLean won it for Peterhead, although Smith did net a last-minute consolation for the visitors who slip back outside the play-off berths. Stenhousemuir remain third after beating Clyde 3-0 at Broadwood, with goals from Ross Meechan, Jamie Longworth and Innes Murray. Annan Athletic climbed to fourth following a 2-0 victory at seventh-placed Berwick Rangers, goals from Blair Henderson and Aidan Smith clinching the points. 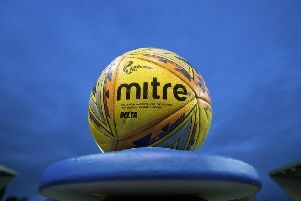 At Borough Briggs, a close-range finish in the 85th minute from Cameron Eadie gave an unconvincing Elgin City a 1-0 win over bottom side Cowdenbeath for whom Kyle Miller was sent off just after half-time.